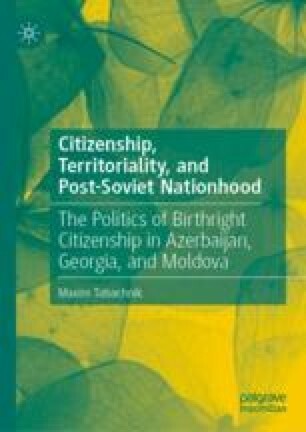 This chapter explores the impact of the geopolitics of dual citizenship on the politics of jus soli in Moldova, Azerbaijan, and Georgia. While the link between dual citizenship and jus soli is not new, the connection to geopolitics results in an unexpected account of the concern or outright fears projected by the image of a “fifth column” of dual citizens serving the interests of a foreign power. The empirical findings firmly tie the politics of territorial citizenship to not only domestic and historical factors but also geopolitics and foreign policy. Aproape un milion de moldoveni bat la porţile României. 2009. Evz.ro. http://www.evz.ro/aproape-un-milion-de-moldoveni-bat-la-portile-romaniei-847510.html, accessed May 21, 2015. Aslanov, Mubariz. 2014. Azerbaijani Parliament’s Committee Chairman: “There Is No Russia’s “Fifth Column” in Azerbaijan”. APA. http://en.apa.az/news/211467, accessed December 12, 2014. Frear, Thomas. 2015. Abkhazia and the West: Rehabilitating Engagement Without Recognition. European Leadership Network. http://www.europeanleadershipnetwork.org/abkhazia-and-the-west-rehabilitating-engagement-without-recognition_2370.html. Georgia “Illegally Denied” Ivanishvili Citizenship. 2012. New Europe. http://www.neurope.eu/article/georgia-illegally-denied-ivanishvili-citizenship/, accessed July 22, 2015. Ivanishvili Is Still Not a Georgian Citizen. 2013. Democracy and Freedom Watch. http://dfwatch.net/ivanishvili-is-still-not-a-georgian-citizen-22308-17527, accessed July 22, 2015. Khashig, Inal. 2002. Abkhaz Rush for Russian Passports. Institute and War & Peace Reporting. https://iwpr.net/global-voices/abkhaz-rush-russian-passports, accessed February 22, 2017. Megeneishvili, Tatia. 2013. The Court of Appeals Rejects Salome Zurabishvili’s Request. The Messenger Online. http://www.messenger.com.ge/issues/2945_september_12_2013/2945_tatia.html, accessed July 28, 2015. “Meşə Qardaşları”: Bakıda ilk hücumda 100-dək polis öldürüləcək. 2014. Bugun.az. http://bugun.az/?page=news&id=3530, accessed January 7, 2015. Munteanu, Carmen. 2013. Un Nou Raport Soros: “Redobândirea Cetăţeniei Române: O Politică Ce Capătă Viziune?” Centru de Documentare Și Cercetare În Domeniul Integrării Imigranților. http://www.cdcdi.ro/publicatie/un-nou-raport-soros-redobandirea-cetateniei-romane-o-politica-ce-capata-viziune, accessed May 21, 2015. National Security Concept of Georgia. 2015. Ministry of Foreign Affairs of Georgia. http://www.mfa.gov.ge/index.php?lang_id=ENG&sec_id=12, accessed January 12, 2015. Navarro, Luis, and Ian T. Woodward. 2011. Public Attitudes in Georgia: Results of a September 2011 Survey Carried Out for NDI by CRRC. Tbilisi: National Democratic Institute for International Affairs. https://www.ndi.org/files/Georgia-Survey-Results-report-101011.pdf, accessed January 12, 2015. Statement on the Situation in South Ossetia. 2008. President of Russia. http://archive.kremlin.ru/eng/speeches/2008/08/08/1553_type82912type82913_205032.shtml, accessed September 15, 2015. Supreme Court Gives Ivanishvili Back Georgian Citizenship. 2015. Democracy and Freedom Watch. http://dfwatch.net/supreme-court-gives-ivanishvili-back-georgian-citizenship-19725-25980, accessed July 22, 2015. Welt, Cory. 2013. Again Citizenship Rules Banning Electoral Contenders in Georgia? Really? PONARS Eurasia. http://www.ponarseurasia.org/article/again-citizenship-rules-banning-electoral-contenders-georgia-really, accessed July 29, 2015. Aзepбaйджaнcкaя oппoзиция oбpaтилacь к B.Пyтинy (Фoтoфaкт) 2013 Haqqin. http://haqqin.az/multimedia/8373, accessed December 12, 2014. Гacaнoв, Aкпep 2013 Pyc – тaм, Aзep - тyт. Haqqin. http://haqqin.az/news/7339, accessed December 12, 2014. Гpaждaнин CШA Caид Hypи дeпopтиpoвaн из Aзepбaйджaнa 11 September ИA REGNUM. http://www.regnum.ru/news/polit/1846531.html, accessed January 7, 2015. Дoвepeннoe лицo пpeзидeнтa B.Пyтинa: P.Ибpaгимбeкoв бyдeт лишeн гpaждaнcтвa Poccии 2013 Haqqin. http://haqqin.az/news/7475, accessed December 12, 2014. Eщe oднa пpoблeмa Ибpaгимбeкoвa: тpeтий пacпopт и дoм в Лoc-Aнджeлece 2013 Haqqin. http://haqqin.az/oldage/7284, accessed December 12, 2014. Ибpaгимбeкoв пoжaлyeтcя в OOH 2013 Haqqin. http://haqqin.az/news/9540, accessed December 12, 2014. Ибpaгимбeкoв: Я вce eщe гpaждaнин Poccии 2013 Haqqin. http://haqqin.az/news/8055, accessed December 12, 2014. Пpecc-cлyжбa пpeзидeнтa Moлдoвы oпpoвepглa зaявлeния o тoм, чтo Bлaдимиp Bopoнин имeeт гpaждaнcтвo PФ 2007 Interlic. http://ru.interlic.md/2007-12-12/3398-3398.html, accessed June 1, 2015. Pacyлзaдe, Зayp 2013 Кoмиccия: Boпpoc poccийcкoгo гpaждaнcтвa Ибpaгимбeкoвa peшитcя в ближaйшиe дни. Haqqin. http://haqqin.az/news/7588, accessed December 12, 2014. Poccийcкий aнaлитик: Пyтин нe пoддepжит Ибpaгимбeкoвa 2013 Haqqin. http://haqqin.az/news/7861, accessed December 12, 2014. Pycтaм Ибpaгимбeкoв – кaндидaт в пpeзидeнты 2013 Haqqin. http://haqqin.az/democracy/5219, accessed December 12, 2014. Pycтaм Ибpaгимбeкoв: Ильxaм Aлиeв в Mocквe 2013 Haqqin. http://haqqin.az/news/8197, accessed December 12, 2014. Pycтaм Ибpaгимбeкoв кaк eдиный кaндидaт в пpeзидeнты вoзвpaщaeтcя в Бaкy 2013 Haqqin. http://haqqin.az/news/6419, accessed December 12, 2014. Caид Hypи дeпopтиpoвaн из Aзepбaйджaнa 2014 Кaвкaзcкий Узeл. http://www.kavkaz-uzel.ru/articles/248990/, accessed January 7, 2015. Фeдepaльнaя cлyжбa мигpaции Poccии: Boпpoc Ибpaгимбeкoвa paccмoтpят в 2014 гoдy 2013 Haqqin. http://haqqin.az/news/8894, accessed December 12, 2014.